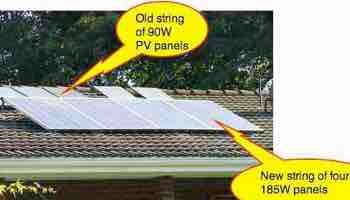 Solar PV systems consider the advantages of being grid tied. 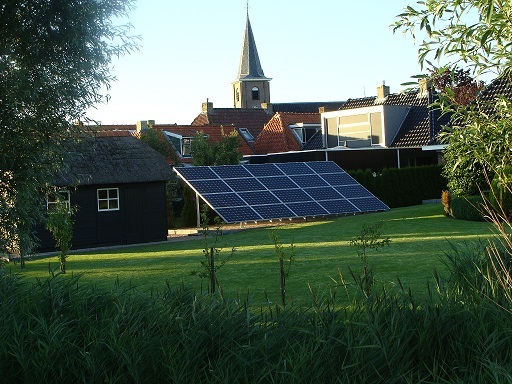 Solar PV systems in the home environment come in three distinct types. Before making a start with installation, it's wise to make sure you understand them. This page was last updated by Bernard Preston on 7th January, 2019. It all has to do with whether your home is going to remain tied to the utility company. Going off the grid is a pleasing notion, but unless you have a lot of money for batteries, it's best to rather consider the other options. It's also possible that you live far from the nearest connection to your utility company, so installation of high tension cables and a transformer to your home will be very expensive. Then, being off the grid may be your only option. If you have a reliable utility company, then a grid tied system, with no batteries, is your best option. In South Africa, Eskom is not at all dependable; total blackout is a constant nagging fear. Add to that the destruction of the local switching gear by frequent power outages, and you have a serious problem. In this scenario, I used to think a hybrid system best; more recently other experts in the field have pointed to serious damage from dirty utility power damaging your equipment. Let's consider all three options. Solar PV systems also discusses whether you need a bank of batteries. The upside of the grid tied option is that you have no need for expensive batteries. During sunlight hours, your Photo Voltaic panels supply your home with direct current energy that is rectified by the inverter and immediately available. Any excess power is fed into the grid, turning your meter backwards, and crediting your account. After dark, or if you need more energy for say heavy machinery during the day, or the oven, you can then rely on the grid to supply your needs. This option is totally dependent on a reliable utility; if the grid goes down, you have no power and will not be able to use even your own sunshine energy. The off-grid option enables you to operate totally independently of the utility. You can cancel your account with them. All your power comes from the sun, and you must have a large battery bank for supplying electricity at night and during inclement weather. This is more expensive than the grid-tied option of the solar PV systems as you need more panels to cater for your highest use, plus the cost of the battery bank. It also forces you to accept certain behavioural changes; you cannot use the dishwasher, the vacuum cleaner and the oven simultaneously, and turn on the electric hot water kettle. Unless you have a very large inverter, of course. This is actually not a bad thing. Managing your use of power is part of the deal. It means you understand you cannot drain your batteries, and accept that you don't vacuum the house on a rainy day. Your battery bank will last about ten years and more, depending on whether you abuse them. Mine is now eight years old now, and beginning to shows signs of aging; but I try not to go below 80% of the storage capacity. I expect them to last another two or three years at least. This bank of eight batteries costs around R50,000, or nearly $4000. "It would make much more sense to extend electricity coverage by promoting off-grid solutions such as solar. This would lead to governments and citizens getting much more bang for their buck." The Conversation, February 26, 2018. Best is a hybrid system where you remain grid tied for heavy use, and at night, but you have a smaller battery bank for power at night and during an occasional power failure from the utility. This also means you can use your own sunshine power during the day, should the grid fail. If you have a fully automated system, it will turn to the grid if you start using more power than your photovoltaic panels can produce. In a less expensive, manual system like I have, heavy usage means a change-over-switch to move to the grid if you want to simultaneously utilise several big current appliances. If you have an unlimited budget, then the hybrid option is best, with a large bank of batteries, at least a 10kW inverter and a fully automated system that will switch you back and forth as the weather and your requirements change. However, that is only for the exceptional person; the added cost of a grid-tied inverter is substantial. Some form of compromise is usually necessary. In a country with a reliable utility, the grid-tied (option 1) with no batteries needed, is certainly best. That's what's used in Holland. I wouldn't do it in South Africa because of the risk of damage to my solar powered generator from utility spikes. Think about all these factors, and talk to your supplier and others who have walked this road before you make a decision. Changes can be expensive. Of importance are any shadows on your PV panels during the day. I have opted for a quite different, unconventional system. I do have a moderately large bank of batteries for when the grid goes down, which is frequently. 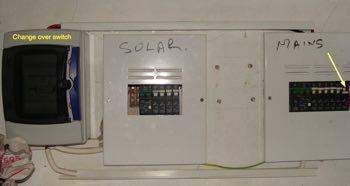 Essentially there are two parallel systems, one solar and the other conventional grid power working together; using the change over switch the mains DB can be supplied from solar; in fact it is most of the day. Almost all the internal lights are supplied exclusively by solar, but the external lights are supplied by Eskom at night; I turn off the inverter when we go to bed to spare the most expensive item, the batteries. Plug sockets to the computers are exclusively solar; I try to keep them off mains as far as possible, the exception being an extended period of inclement weather. The rest of the plug sockets can be supplied by either solar (during the day) or Eskom (after dark). So we can use the induction cooktop stove, or the oven, or the hot water kettle at night without draining the batteries. Notice in the photograph above the yellow arrowed far right breaker; it's down and very rarely is up; perhaps a couple hours a month when there is an extended misty period which happens fairly frequently in our village in the summer. 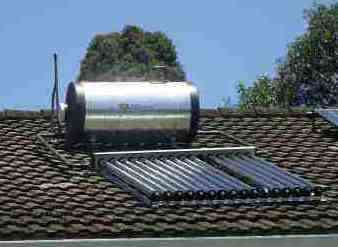 Hot water is supplied in our home by a very efficient solar water heater. One tube above was faulty on installation, with no vacuum, and has been returned to the supplier. This is the way to heat water for showers, baths, the dishwasher and washing machine; it's super efficient; the water literally boils on a very hot day. As always, go bigger rather than smaller. The extra cost of 20 tubes over 16 is minimal, and means we have hot water in midwinter. This passive solar water heater, with the geyser on the roof, is the way to go in mild climates; you couldn't do it in Chicago. Today, I'd consider an induction geyser first, powered not directly from infrared sunshine which is blocked in wet weather, but by a few solar panels; I believe they are the future, but have no experience of them. Research is happening at a frightening pace; new batteries are coming out monthly. Anything bought today will be out of date next week! One really new concept is the Redflow battery which has the huge advantage of being able to completely flatten the battery daily. In fact, if you don't do it, the battery will automatically do a 100% discharge every four days. It comes with a ten year guarantee. See more at Specialized Solar Systems. Comparing apples with apples is important. The Redflow battery has a capacity of 10 kW which can be fully utilized; it's at 48V. How does that compare with my 8 x 200Ah lead crystal batteries? A 200Ah battery at 12V can produce 200 x 12 = 2,400W. Eight such batteries can provide in theory 19,200W, but only half is available. Discharging conventional batteries to zero would shorten their lifespan drastically. 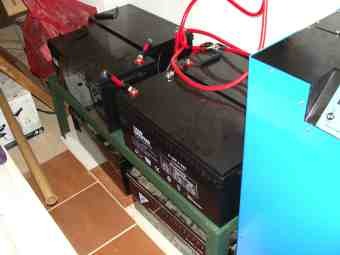 So my eight 200Ah batteries would have utilizable energy very similar to one Redflow battery, namely half of 19,2kW. The big difference is it takes the anxiety out of over-discharging your conventional lead cell batteries. But it's expensive in South Africa; roughly double that of lead crystal batteries. If you have any experience with a Redflow battery, I'd love to hear from you. Induction cooktop stoves are the future, whether you have solar PV systems or not; they use less than half the current, and heat twice as fast as a conventional hob. Only a 3kW or greater inverter can be effectively used for heating. Most electrical stoves are beyond the capability of the average solar PV systems, unless you are grid tied. 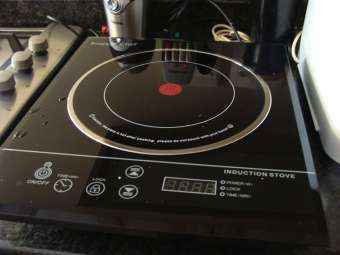 The induction cooktop stoves may be an exception; instead of heating a coil, which then heats the pot, a magnetic field is used to heat the pot directly, reducing power consumption by over a half; and it's faster than gas. All hobs will use induction within a short time, possibly in combination with gas for when the grid goes down. The old coil type of hob should already be history, but it's taking time for the word to get out what a great step forward induction cooktop stoves are. Solar power energy comes for free but considering the various options of how to collect and store it makes for interesting reading; it's important to do so before you consider whether you want to build your own solar generator. Photovoltaics is the process whereby light is absorbed in various materials, usually silicon based which are cheap, which then generate electrons and hence producing an electric current. The price of PV panels is dropping all the time, making the capture of solar power energy a seriously interesting option for the greenie. For our purposes we are looking at fixed solar panels, tilted around 30 degrees, depending on how far from the equator you live, and facing south if you live in the Northern hemisphere. If you have the money, then systems that track the sun are an option; the panels rotate along a south north axis minimising the loss of efficiency when the sun is no longer directly overhead the panel. Such systems are not really an option for the average rooftop solar PV system. If I was to do it again, I'd give serious consideration to building my solar PV systems at ground level, or on carport. This is a lovely example of how it could be done; about 5kW would be my guess. It's located in a small village in the Netherlands. The huge advantage is how easy it is to build, instead of risking life and limb clambering around on your roof and in the ceiling. The second is that there is absolutely no risk of fire from an electrical short in your ceiling. The downside is whether there is significant shading from other homes, trees etc. As you can see these panels are in deep shade still; it's early morning but on a rooftop they would certainly already be receiving some direct sunlight, if they had an east facing solar panels component. There are many ifs and buts when it comes to building solar PV systems but, having walked the walk, I'd give this a serious consideration; or build it on a dedicated outbuilding allowing for east, south and west facing solar panels (in the Northern hemisphere). A change over switch is a vital part of all solar PV systems; that could be automatic, or manual. Both have their advantages. Even if you are off the grid, you'll almost certainly need a generator. The change over switch enables you to toggle back on forth from the utility company to your batteries, depending on the weather. In a manual system, every morning and evening your must have an eye on the weather as to the best moment to shift from the utility to your own solar generator, and back. On some cloudless days, you can simply stay on your solar PV system all day; during inclement weather you may stay entirely with the utility, or toggle back and forth depending on the clouds, and how many panels you have. Bernard Preston is a self-confessed, self-opinionated solar geek! Take these blogs as seriously as you choose; but he is widely read on solar PV systems. You too should make adequate preparation before starting on your solar PV systems. What I can tell you is that we have used 2524kwh of utility electricity in 40 months which is 63kwh per month; that's overall, starting with a very small system of 400W and increasing in phases to our current 4100W of panels. We just added another 930W of west facing solar panels for the late afternoon cooking needs. Our monthly consumption should drop below 40kwh per month. Compare that to your own utility bill. Over and above that, our solar generator is providing 150kwh per month to our daughter's swimming pool pump and an electrical salt water chlorinator, her oven and dishwasher. The size of your inverter for home is an important consideration. Make adequate preparation so you don't need a perhaps repeated solar powered generator upgrade; that's a serious mistake I made.